Home › What is a Dream Catcher? Dream catchers are arts and crafts of the Native American people. The original web dream catcher of the Ojibwa was intended to teach natural wisdom. Nature is a profound teacher. 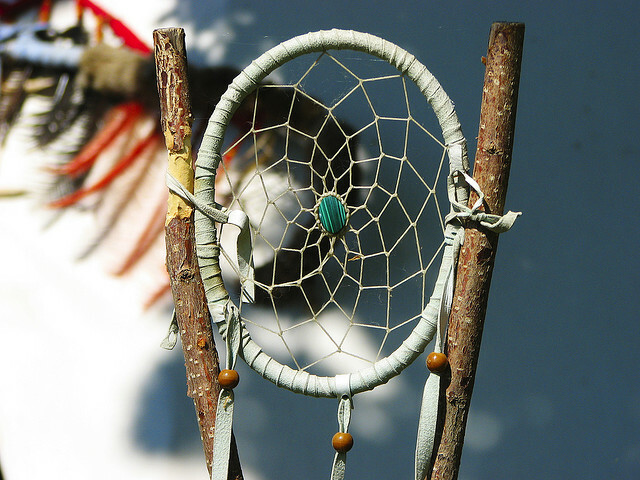 Dream catchers of twigs, sinew, and feathers have been woven since ancient times by Ojibwa people. They were woven by the grandfathers and grandmothers for newborn children and hung above the cradleboard to give the infants peaceful, beautiful dreams. The night air is filled with dreams. Good dreams are clear and know the way to the dreamer, descending through the feathers. The slightest movement of the feathers indicated the passage of yet another beautiful dream. Bad dreams, however, are confused and confusing. They cannot find their way through the web and are trapped there until the sun rises and evaporates them like the morning dew. Originally the Native American dream catcher was woven on twigs of the red willow using thread from the stalk of the stinging nettle. The red willow and twigs from other trees of the willow family, as well as red twig dogwood can be found in many parts of the United States. These twigs are gathered fresh and dried in a circle or pulled into a spiral shape depending upon their intended use. They used natural feathers and semi-precious gemstone, one gemstone to each web because there is only one creator in the web of life.